Microwaves allow us to cook food for shorter bursts of time and with less liquid, which can help preserve nutrients in the food. Microwaves are also very convenient for busy and inexperienced cooks, since they mean less supervision than many types of traditional cooking. You can pop a meal into your microwave, press a few buttons and walk away. The microwave lets you know when your food is done. Even with the benefits of microwave cooking, though, some people have concerns about the types of containers used when heating or cooking food in microwaves. Specifically, some studies have found bisphenol-A (BPA) and phthalates, both used in the making of plastic, can leach from plastic containers into food during microwaving. Some plastic wraps and plastic containers not listed as “microwave safe” can leach these hormone disruptors into food. Even “microwave-safe” plastic cookware lets these substances enter your food if the cookware has become cracked or damaged. Many cooks who like the convenience of microwaves decide to put their food into microwave-safe glass or ceramic cookware instead. In fact, that’s what the Harvard Medical School study suggests for anyone who is concerned about chemicals or plastics entering their food. Xtrema ceramic microwave cookware is designed for microwave use and is made from 100% all-natural ceramics chosen for their ability to withstand high heat. The non-scratch ceramic glaze on Xtrema cookware is safe at any microwave temperature and will not peel off or get into your food. If you want to use your microwave oven with full peace of mind, consider Xtrema cookware. The first microwave oven was created in Maine in 1946, though home microwave ovens weren’t manufactured until 1967. In the 1960s, microwaves were large and expensive, but by 1975, microwave ovens were selling more quickly than traditional ovens. In 1973, inventor Stanley Mason created a company responsible for creating the first line of microwave-safe cookware. Other brands soon followed. Soon it became obvious some plastics wilted in the microwave, and no metal cookware or items could be used in microwaves. In the 1970s and 1980s, a number of specialized microwave products were manufactured, including microwave cooking utensils, cookware and other items. Consider the size of your microwave oven. Sizes can vary, and you’ll want to choose cookware that fits. Think about what you cook. Cooking will be most efficient in a microwave if the size and shape of the cookware fits closely with the size and shape of what you’re cooking. If in doubt, choose round or rounded cookware, since it’ll be very flexible. Invest in a variety of cookware sizes (especially if you microwave often). Again, you’ll want to cook smaller meals in smaller cookware and larger foods in larger cookware. Keep in mind you’ll need to leave some space at the top, especially when cooking liquids, since microwave cooking is more likely to result in spillovers. Look for cookware with good handles. You’ll want to use oven mitts or potholders when removing cookware from the microwave, and sturdy handles make the process much easier and safer. Invest in cookware you can use for freezing, stovetop cooking, regular ovens, and microwave ovens so you get better value. Xtrema ceramic cookware can be used safely on the stove, in the freezer, in the dishwasher, in the oven or toaster oven, in the microwave, under the broiler, on the grill, and as a serving dish. With Xtrema, you don’t need separate cookware and bakeware for every application, and you can even cut back on the number of storage containers in your kitchen cabinets since your meal leftovers can go right into fridge in the same cookware you used for cooking. Consider whether you need microwave utensils, cookware, bakeware or other items. Usually, this will depend on what you like to microwave. If you are on a budget, start with the best ceramic microwave cookware and expand your collection over time. Look for easy-to-clean and stain-resistant microwave cookware. It’s not just about spending less time scrubbing; cookware that stains easily might be allowing bacteria, mold, and other things you don’t want into the cookware surface and back into your food. That’s probably not what you want in your next dinner. Xtrema microwave-safe cookware comes with a sturdy glaze that makes clean-up simple. Xtrema ceramic cookware is also naturally bacteria-resistant and doesn’t allow even the most acidic foods, such as tomatoes, to seep into the surface. Think about the weight of your cookware. If your microwave oven is located high up above the stove and if you have a hard time lifting heavy objects, you may need lighter cookware so you face a smaller risk of upending a hot pan of food on yourself when removing a meal from the oven. Invest in attractive cookware. It’s more pleasant to use cookware you like, but attractive pieces can also go from microwave to table as serving dishes, too. You’ll save kitchen space and money if you don’t need separate containers for serving. Clean-up will also be easier if you need to use fewer containers for your meal. Shop around for lasting, durable microwave cookware. Remember, some microwave cookware may no longer be microwave safe if it cracks, chips or peels, since the layer under the top glaze may not be microwave safe. A durable product is safe and you’ll save money if you don’t have to replace it as often. Xtrema microwave cookware, for example, has a ceramic cooking surface that is designed to resist peeling and flaking. One of the benefits of microwave cooking is it can be a healthier way to cook. Since food is exposed to heat for less time, it may be easier to preserve more nutrients without cooking them off. Microwaves also don’t require oil or fat for cooking the way many stove-top recipes do. You can make your microwave recipes even healthier by choosing better microwave cookware. Xtrema ceramic cookware, for example, is not only microwave-safe, but the ceramic surface of this product resists bacteria. Even if you cook foods that are very acidic, you don’t have to worry about them entering the cookware surface and sitting around, transferring food and bacteria into other foods. Unlike plastic microwave cookware, ceramic microwave bakeware and cookware is designed to last without warping, melting and peeling. Plastic wears down more quickly than ceramic, and as soon as those first cracks appear you’ll need to replace your plastic microwave cookware. It’ll happen even more quickly if you cook at high temperatures, since even the best plastics can withstand only so much heat. Ceramics, on the other hand, are a natural product and can withstand heat, meaning they can last for decades with less hassle. Ceramics are also very versatile and can be popped into the oven, microwave, dishwasher or freezer for your complete convenience. Rather than having separate pots, pans and cookware for your oven and microwave, you can buy one set of Xtrema ceramic microwave cookware for everyday use. Metal cookware can’t be put in the microwave and can eventually develop cuts, nicks, scratches and even rust spots. Both metal and plastic cookware can harbor bacteria, but Xtrema ceramic cookware features a ceramic cooking surface that resists stains and naturally resists bacteria, keeping you and your family healthier. Our cookware also contains no lead, copper, cadmium, aluminum or any other potentially toxic heavy metal. You won’t find perfluorooctanoic acid on Xtrema ceramic bakeware and cookware — a carcinogen that’s often found on non-stick pots and pans. Xtrema ceramic cookware is made from all-natural minerals, so you don’t have to worry about man-made toxins in your cookware or your food. If you invest in quality cookware, taking care of it will be easier than you think. Xtrema microwave cookware, for example, has a ceramic heating surface and a non-scratch ceramic glaze that will not peel or be compromised — even at temperatures above 2500º F. With a sturdy glaze, you don’t have to worry about damaging the cookware when you clean — even if you have to scrape to get cooked food off the surface. Don’t be afraid to experiment. Ceramic cookware lets the true taste of your dishes shine through because the flavors of the cookware material or your last meal don’t seep through. So if you’ve invested in ceramic cookware, try a few new recipes you find tempting. Do check out recipes for the microwave. You might find they are more versatile than you thought. Don’t rush in if you’re new to cooking. Try a few simple recipes, like homemade microwave popcorn or a simple cake, and slowly try more adventurous recipes. Do use trivets or potholders under your cookware and bakeware to protect tables and counters. Do use a thermometer to make sure meats and dishes with eggs reach safe temperatures and are cooked all the way through. Don’t heat eggs in the microwave in their shell. Even if the egg has been cooked before, pressure can build up in the egg during cooking, and the egg may explode after being taken out of the microwave. Read the directions for your microwave for the correct ways to cook different foods in your microwave. Do take foods from the microwave to the table and put any leftovers in the fridge. Xtrema cookware lets you go from fridge to microwave to table without any worries. When you’re done with your meal, just pop a cover on the cookware and store leftovers promptly. Do consider your microwave oven. If you’re following a recipe, keep in mind that microwaves vary. A recipe calling for five minutes of cooking might only require four minutes in your microwave. Always check food and take notes on recipes you like to keep track of the correct times and temperatures for your specific microwave. Don’t worry about seasoning your Xtrema ceramic microwave cookware. There’s no need — Xtrema cookware is ready to use out of the box. Just wash the cookware to get rid of any packaging materials or dust accumulated during the delivery process and get ready to cook! Don’t be afraid to make use of the Xtrema ceramic cookware versatility. Xtrema ceramic cookware can go from microwave to oven or broiler, which can make cooking a lot more fun and adventurous. For example, consider cooking your meal in your microwave and then popping it under the broiler for a few minutes to brown it and add a bit more flavor. It’s a great idea to add some color and interest to meats and potatoes, especially. 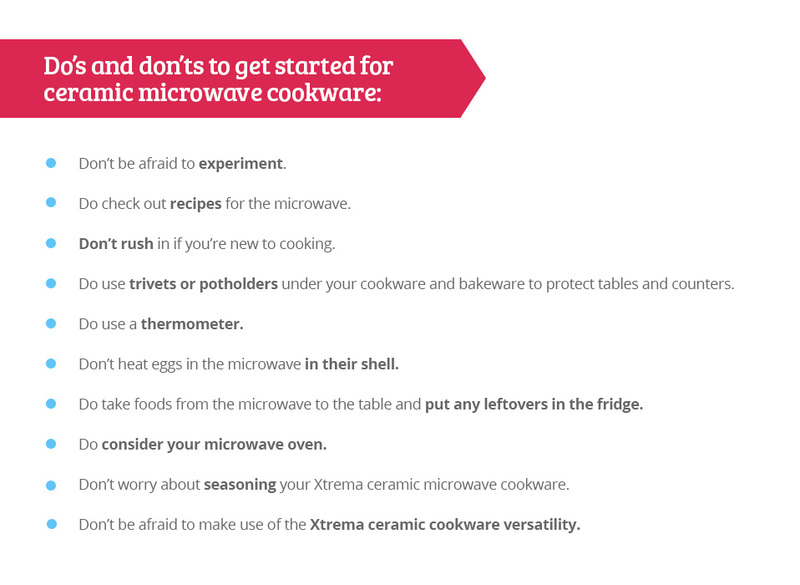 Xtrema makes it easy to start your ceramic microwave cookware collection. Ceramcor has a range of ceramic cookware sets with lids just waiting for you. Choose the right colors for your kitchen and get ready to whip up healthful meals in a hurry. Or look at the range of ceramic bakeware for all your baking and braising needs. 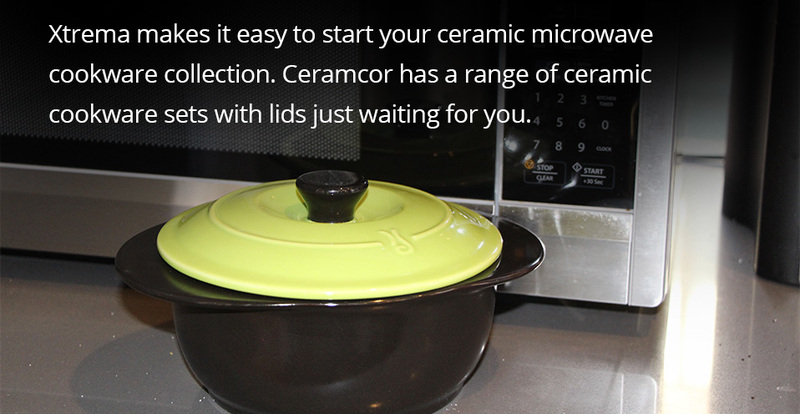 If you want to make the best use of your microwave, check out the range of options at Ceramcor.